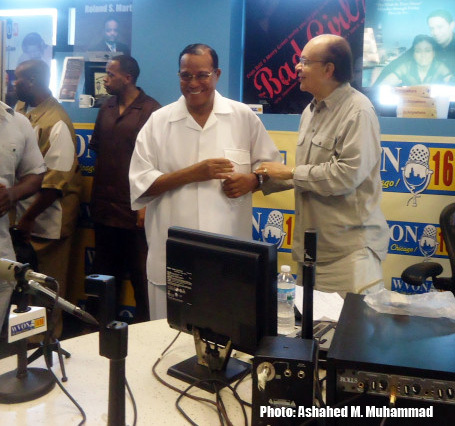 Brother Jesse Blog: (Video) Minister Louis Farrakhan appears on Cliff Kelley show in Chicago: "We need to come out of the church, out of the mosque, out of the synagogue and get in the streets"
(Video) Minister Louis Farrakhan appears on Cliff Kelley show in Chicago: "We need to come out of the church, out of the mosque, out of the synagogue and get in the streets"
On July 6, the Honorable Minister Louis Farrakhan appeared on the Cliff Kelly Show on Chicago's WVON Radio for two hours. They discussed the re-opening of Salaam Restaurant, solutions to the on-going violence in Chicago, America's educational system and of course foreign affairs related to Iran, Syria, Egypt and Libya. "Brother Farrakhan is going to lead the F.O.I. into the streets!" said Minister Farrakhan is response to a question regarding the Nation of Islam's role in stopping the violence. "These young people are our children. They are our flesh and our blood...We’re coming into the streets to show our young people the love that they are missing. And I advise pastors: This bourgeois attitude of our staying in the church, in the mosque, in the synagogue, when all of the problems are in the streets. We need to come out of the church, out of the mosque, out of the synagogue and get in the streets where the problems are. And use the wisdom that we have been given to help our people come out of this condition." In regards to America's pending war against Iran, Minister Farrakhan said, "The hand of America is a bloody hand. I fear for you America, soon your hand will be cut off. America, if you continue in this path, your power will be broken in war. The American people need to rise up against the warmongers bringing America down...If America bombs ‪Iran‬, you can't look for our support. I wouldn't ask one American to die for Israel."